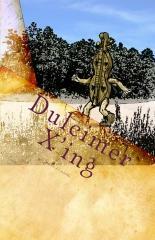 Book One: Dulcimer X'ing is the first book in a series of adventures for Homer, the dulcimer. Not being a very well known instrument Homer faces obstacles to becoming accepted. Follow Homer as he wins over his critics and turns enemies into friends! You are invited to come along and travel with Homer as he discovers who he is and how much of an impact he has of those around him. The title Dulcimer X'ing evolved from many different working titles as the book progressed. If you have ever seen the signs for Duck X'ing or for Deer X'ing then you understand where the sign Dulcimer X'ing would come from. It can also be used for a 'Dulcimer sighting.' Since dulcimers are still quite rare in the general music community anytime one is seen can bring up very different emotions. I wanted the title to be representative of how infrequent you might actually see a dulcimer. Third grade was going to be a blast. Mrs. Henley had pulled out all of the different types of percussion instruments for the students. If you had ever seen the play about percussion instruments, you had a sense of what you are in for when third grade gets up on stage. Besides the recorder group from fourth grade Mrs. Henley was planning to have the string instruments play. Mrs. Henley thought this would be the best place for Homer. Since he was a dulcimer he could play with the guitars and fiddles. Homer was not a very loud instrument. Mrs. Henley would have Homer sit in front and put the microphone close to him so the audience could better hear him. The day of the show Mrs. Henley was busy worrying about last minute details. Even though Mr. Campbell and Miss Ellen would be backstage to help direct the students on and off the stage, Mrs. Henley just knew something would go wrong. 12/13/09 I've read your book and you've done a fantastic job on it. I think every grade school teacher k - 3rd grade could use it for their class. Or cold be a great stocking stuffer too!!!! 1/23/10 I like this book. It is a great book to introduce kids to instruments . It teaches virtues in a pleasant say. I can't use this book with my mentally challenged students, because it has too many big words. I would read it aloud to children up to grade 5. It is a book of imagination , children can related to , while teaching correct behaviors. I say "Way to go! "d f Waldron" Great job Homer, Dulcimer friend, Carolyn Long.